saw, huge in the sky, the mushroom cloud of a nuclear explosion. He stared at it, wondering. The thunderhead was dirty black, streaked with billows of grey. It rolled and boiled as it climbed into the clear blue day, casting a vast shadow upon the hills beyond. But there was no sound, no rumble of an explosion. 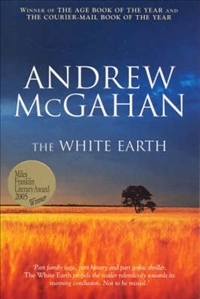 Review: The White Earth is a very well written piece of Australian literature which highlights our short yet complex history, the invasion of the land by the white people and the disruptions it caused for many, many generations and how it still impacts society today. Young William is the POV, his father dies in a farm fire leaving his already mentally unstable mother a widow and penniless. They move in with his great uncle John McIvor, into a dilapidated homestead on Kuran Station in the Darling Downs. William finds his new home aversive and is intrigued by his mysterious uncle who doesn’t introduce himself until a week later. William is diagnosed with a fake illness so he can take 3 months off school to fulfil a role his Uncle has in store for him. His uncle has a strong connection with the land, a connection he doesn’t want lost when he dies. William has until the end of the year to earn the right to inherit the station but at 9 years old he isn’t even sure he wants it. We learn of his uncle’s long fight to be the landowner of Kuran Station which took more than 40 years. John’s story was told very well and it made the story so much more robust as the present day was complimented with the past. The characters of John and William were very well developed and to a lesser extent Ruth, John’s daughter. They had very real motivations, desires and conflicts. I felt frustration and anger towards William’s mother who remains indifferent and depressed throughout the story, unaware of the impact her emotional absence has on her young son. The White Earth had me guessing to the very end what would happen to the property and how William would make sense of it all. It was very cleverly written and left me contemplating historical and political issues that have persisted into modern day Australia. I absolutely loved this book. Gave me a cathartic feel every time I put it down. I’m even using it as a related text in the upcoming HSC! It’s been some time since I read this one, but it was a book I found very moving. So glad you enjoyed it Dave!